The Pens Hockey Show: Time to Rid Pittsburgh of Some Sabres! penalties and have been working hard to make their penalty kill units strong. Individual players have been bringing their "A" game as well. Marc-Andre Fleury has earned two shutouts in his last three games, giving him 30 career shutouts! Also, Evgeni Malkin is currently holding onto a nine game point streak and is tied with Ryan Johansen of the Columbus Blue Jackets for the longest active streak in the National Hockey League. The Penguins may be on a roll, but they have great numbers when it comes to battling the Buffalo Sabres. Since February 1st, 2010, the Penguins are 12-4 against the Sabres. Moreover, Sidney Crosby has recorded a point in 17 consecutive games against the Sabres, which his is longest active streak against any team. This should prove to be an interesting game, but the Penguins must stay focus. They are riding on a high note right now and all the numbers are in their favor when it comes to the Sabres. However, the Penguins can't lose focus on the objective at hand. They need to come out with speed and stick to their game. This is no time to be side tracked or become over confident. Lets Go Pens! 0:00- PENS WIN 5-0 OVER THE SABRES! FLEURY EARNS HIS 3RD SHUTOUT THIS SEASON AND 31ST OF HIS CAREER! AMAZING EFFORT BY THE PENS! 0:45- Flower stretches out to make a lightning quick save on a wrap around chance! 1:42- Maatta works magic on the defensive side of things. The Pens PP comes to an end. 2:39- Pens PP is 3 for 4 tonight against the Sabres! Also Sid now leads the NHL in scoring with 18 points! 3:42- The Sabres haven't seemed to have learned there lesson as Girgensons is headed to the box and the Pens impressive PP is headed back onto the ice. 6:49- GENO SCORES ON THE PP!!!!! The Pens cycle the puck with deadly intent on the PP! Geno slaps a rocket of a shot right over the blocker of Enroth! 5-0 Pens! 7:28- Adams is released and now the Pens deadly PP is underway! 7:38- Ennis is called for interference giving a chance for 4 on 4 hockey for 10 seconds. 9:28- The Sabres will get a PP as Adams is headed to the sin bin for holding. 9:40- The Pens are doing a good job of keeping the Sabres at bay and not going completely on the defensive. 16:25- The Sabres are killing themselves as Deslauriers heads to the box and the Pens bring out their red hot PP! 17:27- KUNI SCORES ON THE PP!!!! The Pens deadly PP comes out onto the ice! Tanger receives a pass from Sid and fires a hard shot from the blue line! Kuni redirects the puck at the front of the net over the pad of Enroth! 4-0 Pens! 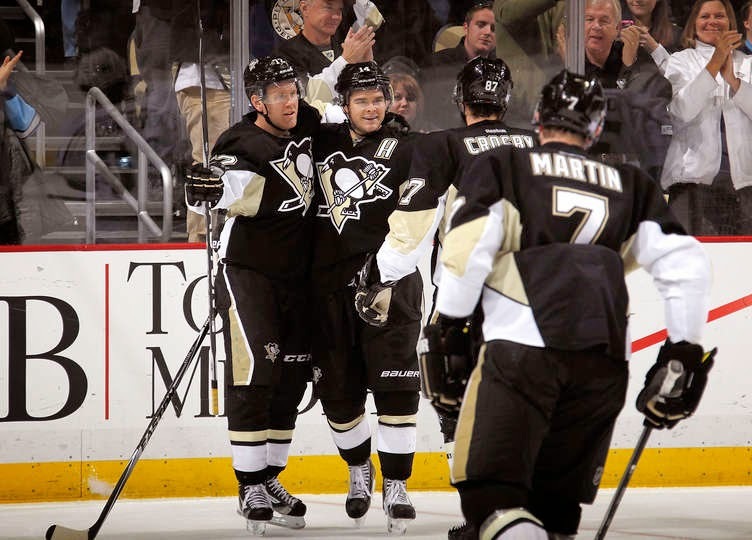 18:00- The Pens kill the Sabres PP making it 24 straight kills. Sid ends up drawing a penalty on Weber and the Pens get a PP of their own! 20:00- Third period time! Comeau starts the period in the box and Sabres have a PP chance. The Pens need to keep up the speed and make sure they don't give the Sabres any room/opportunities! Lets Go Pens! 0:00- Second period comes to an end and the Pens have extended their lead to 3-0 over the Sabres! 1:00- The Pens are really bringing to the Sabres as the period is coming to an end. 3:51- HORNQVIST SCORES ON THE PP!!! The Pens have a tic-tac-toe set up as everyone on the PP touches the puck! Geno passes to Kuni at the side of the net! Kuni outlets to Hornqvist in the slot and Hornqvist rips one under the blocker arm of Enroth! 3-0 Pens! 4:28- The Sabres now have to kill off a Pens PP. 1:16 left on the PP for the Pens. 5:10- 4 on 4 hockey for 44 seconds as the Sabres are caught with too many men on the ice. 6:28- The Sabres will get their second PP of the night as Sid takes a seat for hooking. 6:41- Sid flies down the wing to whip a wicked backhand on net, but Enroth gets a piece of the puck! 6:35- The refs review the previous play as the puck looked to have crossed the goal line. The refs rule a no goal as the whistle had been blown. 8:06- COMEAU SCORES!! Comeau takes a pass from Malkin flying down the center of the ice! Comeau fires a rocket shot over the glove of Enroth! Malkin extends his point streak to 10 games! 2-0 Pens! 8:58- Flower makes a pad save on a redirected shot. 12:10- Enroth comes up with an unreal save as Maatta backhand's a shot in the slot area. Great puck movement by the young defensemen. 14:23- The Sabres have had something going right now. The Pens seem to over passing the puck. Looking for the pass instead of the shot right now. 18:07- Flower denies Foligno with a pad save and the Pens converge on the net to clear the puck. 20:00- Second period is underway! The Pens need to keep pushing the Sabres back! Lets Go Pens! 0:00- First period ends and the Pens have the lead 1-0! 1:28- Maatta's backhanded shot is stopped by the pads of Enroth. The Pens are pinning the Sabres in their own zone right now. 3:59- Letang blocks a shot with his left foot. Limps to the bench...that one stung. 5:20- The Pens make it 23 straight kills. 6:27- Duper and Scuderi get a 2 on 1 chance. Duper's shot is redirected and Enroth is just able to glove up the puck. 7:20- The Pens PK will be tested for the first time tonight against the Sabres PP as Maatta sits for holding. 8:52- Sid bumps into Enroth and he falls down. This happened after Enroth messed with Sid. Weber was not happy, so be on the lookout for Downie time. 12:24- Malkin battles in the corner to keep the puck in the offensive zone. Great effort by Malkin. 15:34- KUNI SCORES! Sid takes a pass off his skate from Maatta and charges into the Sabres zone! Sid takes on two defensemen and gets the puck to the front of the net! Hornqvist takes a whack at it, but Kuni's whack at the puck slides under the pad of Enroth! 1-0 Pens! 16:04- Letang fires a shot from the blue line that is saved by the blocker of Enroth. 17:16- A good pace to start this game by both teams. The Sabres are doing a good job of clogging up the neutral zone. 20:00- Puck drop at Consol! I would love to see the Pens come out with speed and be aggressive early! Lets Go Pens!